Before we start talking about gas grills costing under $250 let me make one suggestion. Think again about Charcoal. While you can't get a great grill for under $250 you can get a very good charcoal grill (for half that amount actually). True, when you add up buying charcoal versus buying propane, a charcoal grill will cost more in the long run, especially if you cook out a lot, but a good charcoal grill can easily last you a decade while a low-cost gas grill will probably only last you a few years. Yes, a gas grill is easier to use and more convenient, but a charcoal grill gives you a lot of versatility in cooking abilities and a more authentic flavor (see Charcoal vs Gas for more information). It just a suggestion, but one I think you should consider. When it comes to gas grills under $250 (see my list of the Top 9 Gas Grills under $250 for specific recommendations) there are a number of options and you can pretty much find them anywhere that sells grills (especially the larger retailers). The big names in this price range are Char-Broil (also sold under the Kenmore name), Brinkmann, Broil-Mate, and Uniflame. These grills are typically built for one season and change every year. The quality of their construction tends to change with the prices of the materials out of which they are made. These grills also tend to go on sale frequently so look for a sale price and try to avoid buying them at full price. Most grills in this price range are manufactured in China and come with warranties good for 1 to 3 years. In this price range I really recommend staying away from any gas grill that is loaded with features or is large with several burners. You will do better to get as simple a grill as possible. All those extra features and all that extra metal costs money. Manufacturers and retailers have to make profits so not a lot of money went into these grills. I recommend a small with no more than around 300 square inches of primary grilling space (I would look for more like 250 square inches). Look for a grill with two burners and around 24,000 to 30,000 BTU maximum output from the main burners. Avoid side burners and grills with enclosed cabinets or any other kind of extra. You want a grill that can cook burgers and hot dogs and not rotisserie chicken or pork shoulders. The heart of any grill is the burner and in this price range burners are typically pretty cheap. When shopping for a gas grill always dig inside to see how it's made. Honestly, they won't mind and if they do they have no business selling gas grills. Remove the cooking grates and whatever sits between them and the burners. Typically this is going to be a thin piece of porcelain coated steel. Take a look at the burners inside. Take a hold of them and feel how strong they feel. If you can bend the metal you don't want to buy this grill. Unfortunately, gas grills in this price range are not going to be made with the best materials or to last very long. 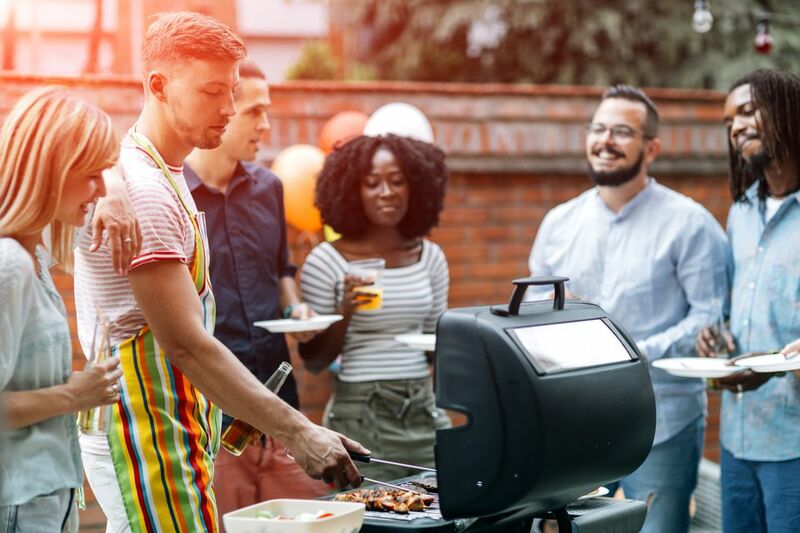 Expect a gas grill under $250 to last on average 2 to 3 years depending on your climate, how often you use it, what kinds of foods you cook (acidic marinades are hard on grills), and how well you take care of it. I know people who have been using very inexpensive grills for several years and others you haven't gotten a year out of it. Remember to register your grill with the manufacturer and to take advantage of warranty parts as soon as you need to. It is going to be the internal components of these grills that fail first particularly the igniter and the burners. Igniter failure is a Common Grill Problem and can usually be fixed easily or simply bypassed by using one of those long lighters. Burners need to be regularly cleaned to clean off build-up on them and to keep them working correctly. Get down to the burner and gently brush off any debris. Make sure that the ports (the little holes along the burner) are clear. To protect the burners you can coat them in cooking oil (with a high Smoke Point. This will help, but oil breaks down at high temperatures and loses its ability to keep the burners from rusting. The best part of doing this regularly is that it forces you to get in your grill and clean it out. This will do more to add years to the life of this grill.